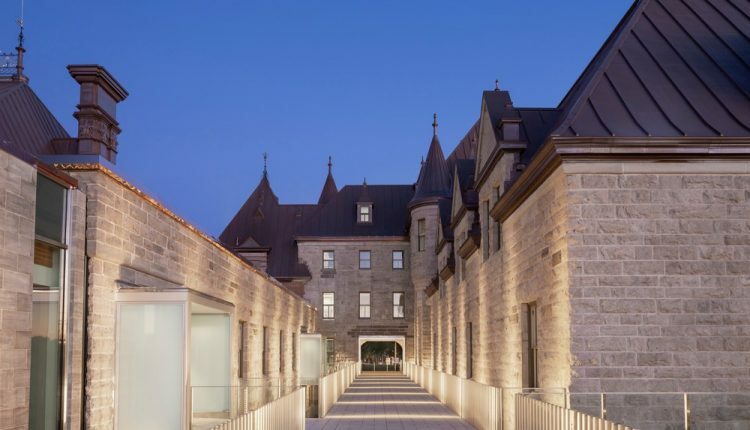 The consortium of Architecture49, DFS Architecture & Design, and St-Gelais Montminy + Associés / Architectes (STGM) is proud to note the reopening of the Voltigeurs de Québec Armoury, a decade after the April 2008 fire that caused extensive damage to the building. Public Services and Procurement Canada engaged the architectural team to design and execute reconstruction work that would safeguard the building’s heritage and respect the architectural integrity of the drawings prepared in 1885 by Eugène-Etienne Taché (1836–1912). 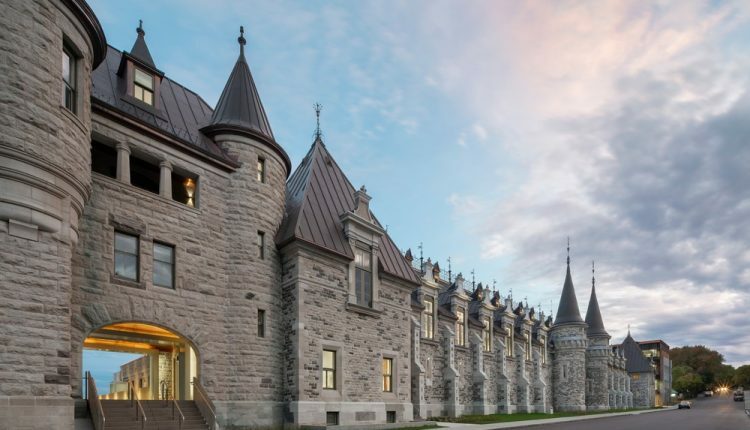 The mandate also entailed the opening of the heritage building, the home of the Canadian Forces’ Voltigeurs de Québec infantry regiment, to the people of Quebec City and visitors to the city. The reconstruction project was launched in 2011 and included four main components: restoration of the east wing, dating from 1913-14, where the regiment’s offices are located; addition of a footbridge leading to Battlefields Park and the addition of a new wing on the west side of the armoury, with office space for the federal government; reconstruction of the drill hall as a multifunctional space and construction of a new lobby on the south side of the building to support that space’s new activities; and the creation of a regimental commemorative hall for Les Voltigeurs de Québec. The work required extensive conservation work on the armoury’s interior and exterior masonry walls and its plaster elements, wooden doors and windows, as well as construction of a new copper-clad roof and a complex addition to the original building. Located near the historic district of Vieux-Québec, a UNESCO World Heritage Site, the Voltigeurs de Québec Armoury faces the Plains of Abraham, where the French and British empires met in battle in 1759, changing the course of North American history. The heritage conservation strategy was based on a clear and honest approach to the Armoury’s many layers of history: the 1887 original structure, the expansion of 1913-14, the 2008 fire and the new rehabilitation project. The consortium decided to conserve, stabilize and ensure the long-term visibility of these important milestones in the Armoury’s history, designing a coherent, dynamic whole that will underscore the site’s cultural value for generations to come. The 2008 fire and subsequent curetage revealed vestiges, signs of aging and old outlines worthy of being expressed and highlighted through the rehabilitation project. 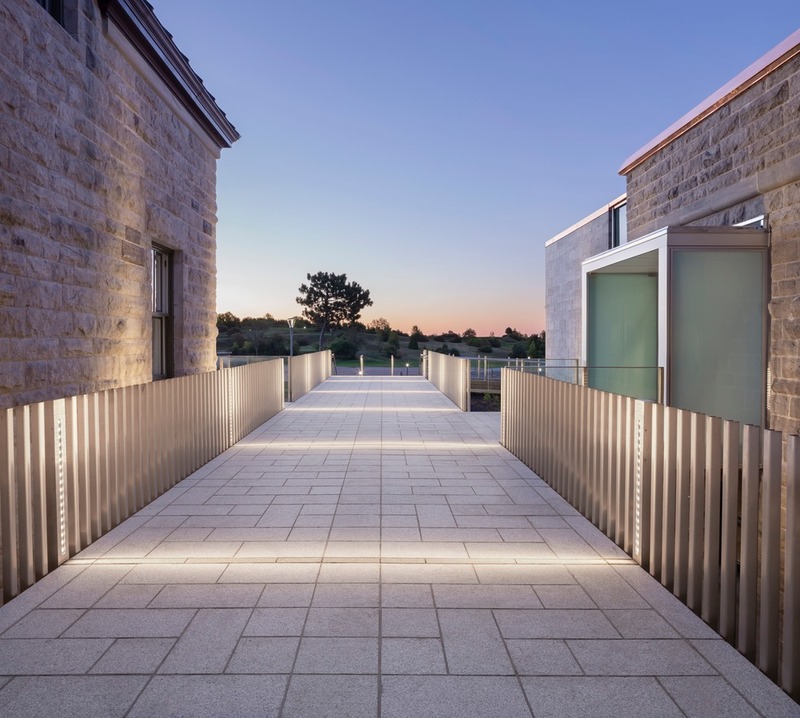 The intent behind this approach was to preserve the site’s history, architectural profile and ambiance. The plan was not aimed at performing a superficial, selective restoration of certain elements, but at revealing the original outlines and intentions behind each stratum of the past, to achieve a thorough understanding of the Armoury’s features. Thus, for example, plaster elements were stabilized and masonry was left exposed where it had been revealed by the fire and the subsequent removal of damaged interior finishes. 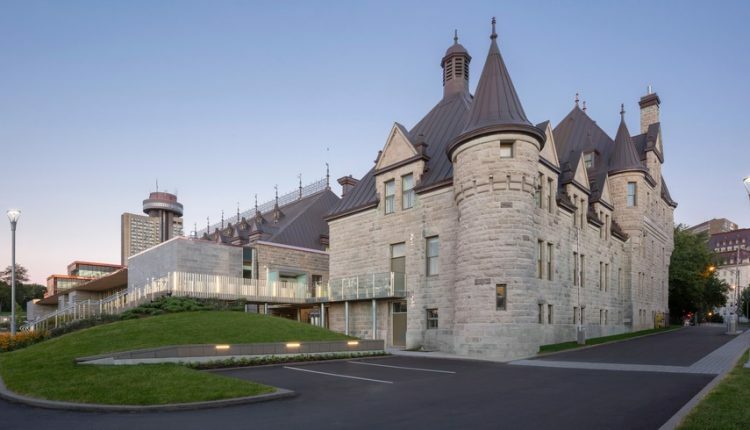 The Armoury is one of Canada’s finest examples of chateau-style architecture, with its wall dormers, pepperpot turrets, buttresses, massive stonemasonry and imposing copper roof topped with a ridge crown. All these elements were reconstructed in a manner consistent with the original plans, but compliant with current technical standards. To facilitate the retention of heritage designations, and to optimize the facilities to make them more useful to the public and the government, the building was expanded through the addition of contemporary elements, such as the west wing to house federal offices and the lobby on the side of the building facing Battlefields Park. In creating these elements, the team integrated contemporary architecture, visually distinct from the existing structure, while taking care to choose materials consistent with those used in the original building. The project brief included a mandate to provide access to the public spaces of the Armoury and Battlefields Park from Wilfrid-Laurier Avenue. 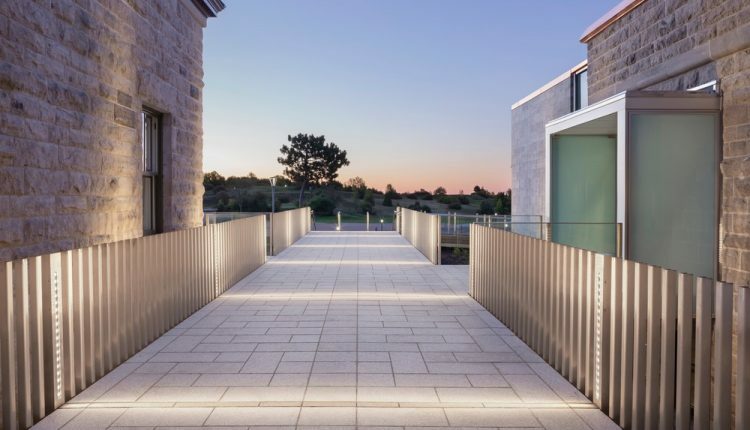 The designers opted to create an elegant footbridge across the 1913-14 wing, conceived as a transition allowing visitors to appreciate the walls and masonry on either side as they enter the commemorative hall. 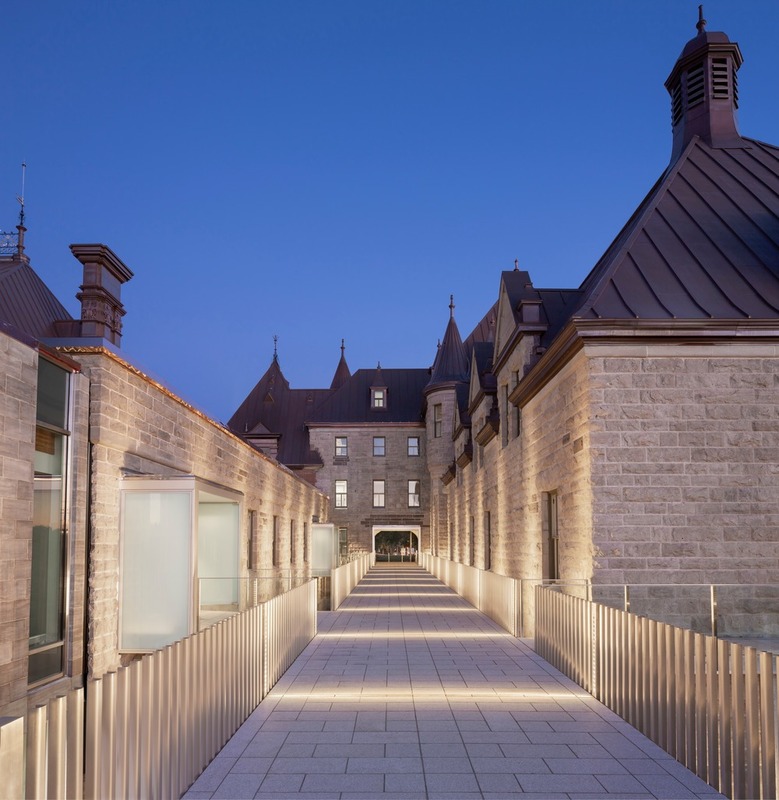 The wing was completely renovated to accommodate the Voltigeurs de Québec regimental offices. After crossing the bridge, visitors enter the commemorative hall, a vast space decorated with the Voltigeurs’s regimental colours. 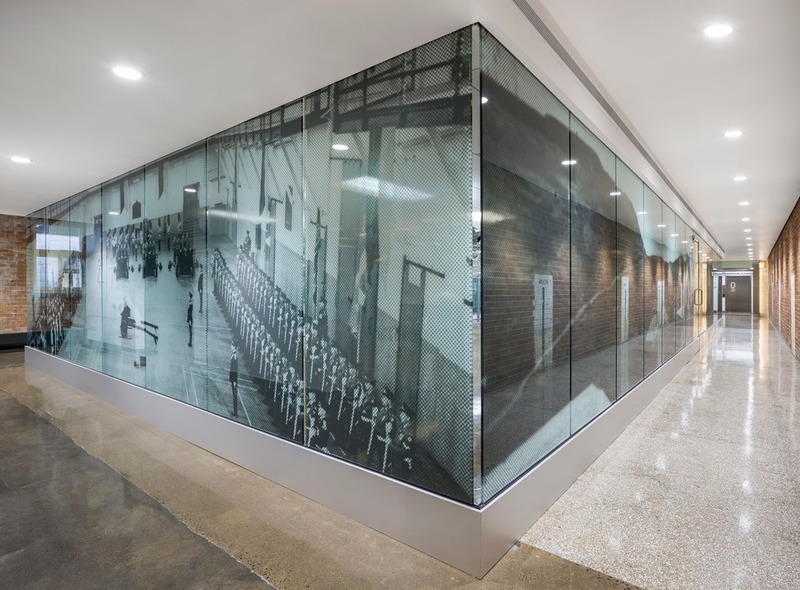 At the centre of the hall is a staircase leading to the basement, where targets from a former indoor shooting range are on display along with a number of archival images. A simple volume, the lobby is a transitional space for users of the multifunctional room, as well as an ambulatory and a space for events such as receptions and press conferences. 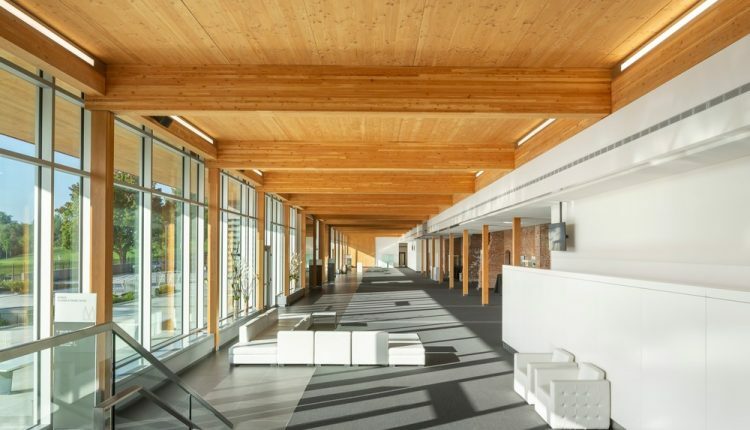 The lobby is characterized by a column structure and engineered-wood bridging with hidden connections. Its envelope is made of noble materials – monumental limestone masonry – and generous windows are installed in the curtain walls. 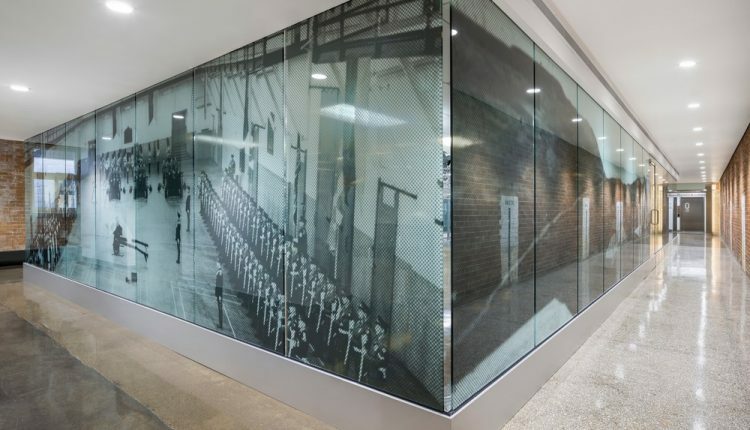 This public space also includes zones commemorating the military history of the building and Les Voltigeurs de Québec through a selection of memorabilia. The main space in the central building, which had been a drill hall before the fire, has been converted into a multifunctional room equipped with cutting-edge event production equipment. This highly versatile space is suitable for corporate, private and cultural events with up to 1300 attendees. The decision to reconstruct the multifunctional room’s roof with an exposed wooden structure gives users a glimpse of the drill hall as it appeared when it was originally built in 1885. 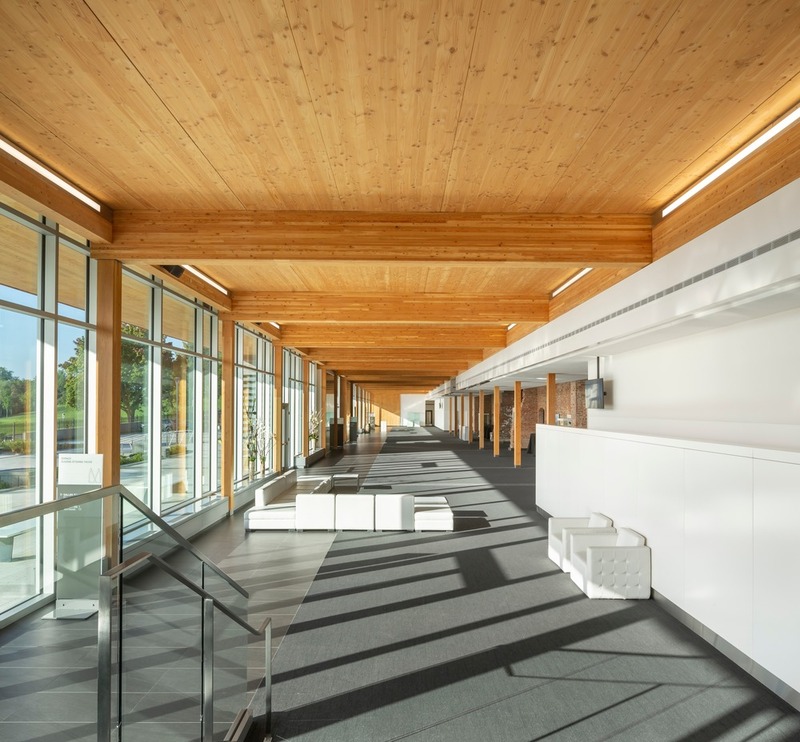 The engineers and architects designed an exposed timber-truss structure, without columns, adapted to the space’s new operational conditions. The interior brick walls have been left exposed, and new finishes help highlight the original elements, while maintaining appropriate restraint. In a few short years, the ruined structure was transformed into a room with impressive technical characteristics, thanks to the carefully coordinated work of architects, engineers and specialists in acoustics and event production. This contemporary addition now houses federal government offices. Its architectural language is largely grounded in the reinterpretation of materials and in volumetric interplay with the Armoury’s copper roof. Inspired by the east wing, it is clad in stone masonry while the openings are bays of similar dimensions. These bays are simple and regular; instead of having period ornamentation, they are based on an understated design language. Echoing the visual power of the main structure’s copper roof, thin copper vertical blinds were strategically inserted in front of the curtain walls, recessed from the wing’s lower envelope, enhancing the space’s openness to the landscape while reducing the harshness of excessive direct sunlight. There were numerous challenges for the professionals involved in the project: reconstruction of a fire ruin, functional requirements, decontamination, meticulous heritage conservation work, structural reinforcement and building-code compliance upgrades. As a result, nearly 700 people were involved with the project at every step, from planning to construction, and nearly 70,000 hours of work were required for architectural services alone. 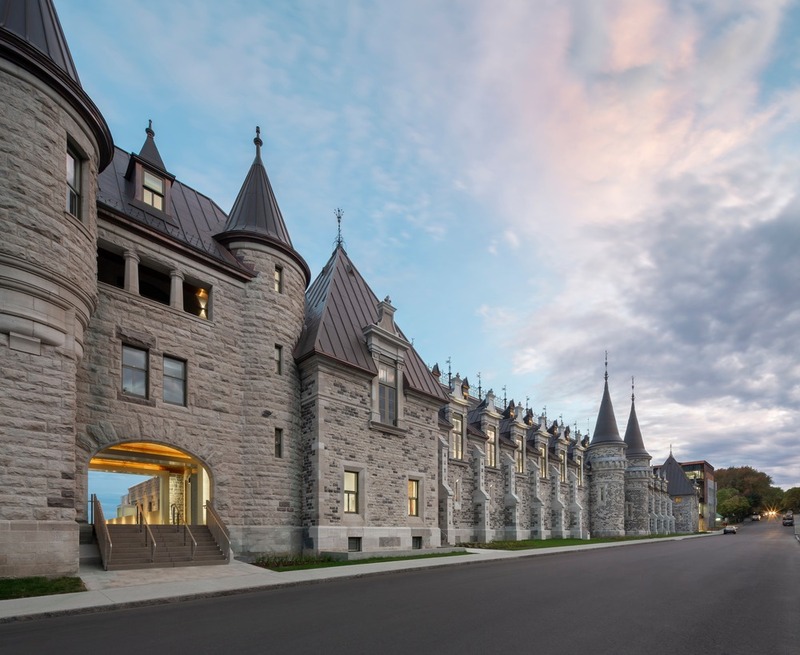 The A49 / DFS / STGM consortium and its partners are proud to have helped give new life to the Armoury, allowing this architecturally significant treasure to remain an important landmark for the nation, the Voltigeurs de Québec regiment, the people of Quebec City and future generations.